Bright coloured kites, spools and their coloured threads paint a perfect picture in the Indian skies especially during the harvest festivals and the Indian independence day. In the country, kite flying goes beyond festivities – it is an expression of patriotism and also marks the beginning of a new season. The sky is filled with seemingly tiny colourful quadrangles as people shout “Aayi-bo-kaate” (I got you) from their rooftops as they attempt to bring down another person’s kite by cutting its thread. The air is filled with the noise of “Aayi-bo” as neighbours also join the winner for the chant. The tradition of kite flying in India is ancient and believed to have been brought into the country by Chinese travellers Huin Tsang and F Hien. The earlier Chinese kites were rectangular and flat, and were used for measuring distances, signaling and also for communicating military operations. After kites were introduced in India, they were named in Hindi as patang (fighter kite). Over the years, both kite-flying and kite-making skills have evolved. From the ancient delicate ones made of paper and wooden sticks, they are now made with flexible materials that make them more resilient. Shaped like a diamond, they have a center spine and a bow shaped intersecting spine that gives shape to the kites. Kites have been gradually evolving for a long time now. Today, there are more varieties available as compared to 15 years ago. There are more colours and patterns to choose from. Also, I remember when I was a 10-year-old, a regular kite would cost INR 1 and price of a kite slightly bigger in size would never go beyond INR 5. Now it costs INR 5 for a regular sized kite and there’s no upward limit to the price of bigger kites, says Abhinav Verma, who has been flying kites for the last 20 years. “Kites have become more thematic. On the Independence Day, you can see kites designed in orange, white and green (colours from the India flag) with slogans like ‘born to be free’, ‘I love India’, etc. Another trend is that these kites are also used to spread social awareness with quotes like ‘beti bachao, beti padhao‘ (save and educate girls),” says Kalpana Sharma, a resident of west Delhi. On the Indian Independence Day (August 15), kites soar high in the sky, symbolising a free nation that India became on this day. But apart from being just a symbolical form of celebration, the flying of kites also has a historical significance. ‘Go Back Simon’, was the slogan used in protest against the Simon Commission in India during the 1920s. At that time, Indians used kites as a medium of protest. Kites with the slogan ‘Go Back Simon’ written over them were flown. 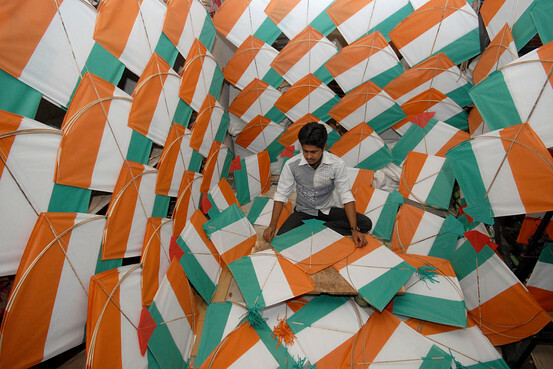 Since then, kite flying has become a tradition for Indians on Independence Day to praise autonomy from British tenet. Besides spreading out the national flag on August 15, Indians get occupied with kite flying as an expression of freedom, joy and patriotism. “The sky used to turn into a rainbow. I am not exaggerating but there used to be no space for the birds to fly. Today, I see the number of kites in the sky have reduced. But of course there are others who are carrying forward the culture. Kite flying is a matter of family get togethers, good festive food and some kite flying competitions with the neighbours, especially on the Indian Independence Day,” says Baldev Raj (75), a retired railway officer living in New Delhi. Different parts in India have various times of the year dedicated to some festivals centered around kite flying. One of the most significant amongst them is Makar Sankranti or Uttarayan, a festival celebrated on January 14. This is the day when the winter season officially ends and spring starts – a transition symbolic of discarding the previous season’s bad and the beginning of a fresh new season. 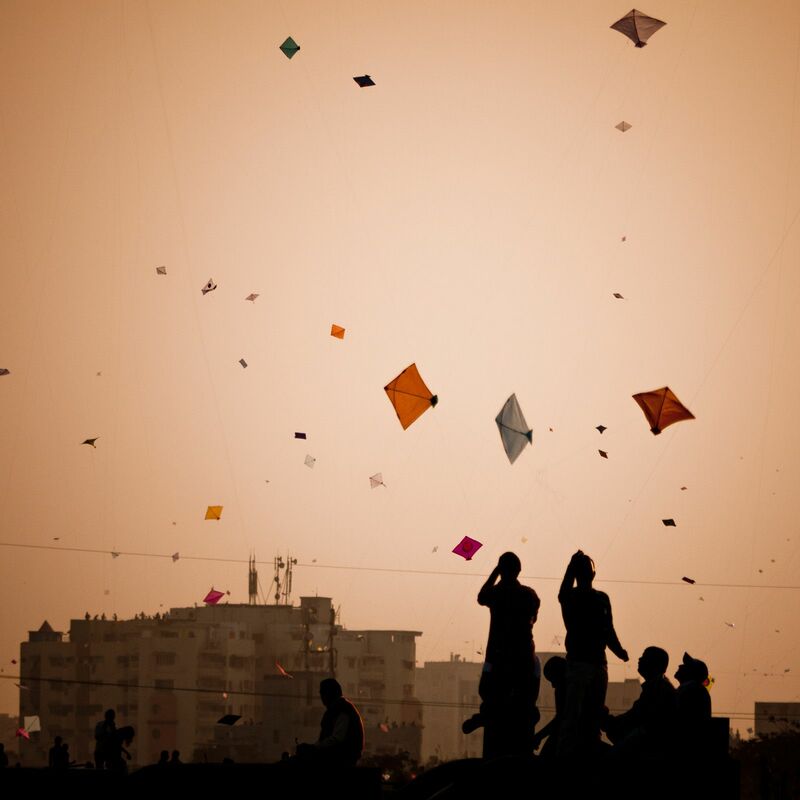 Every year on this day, various states in the country like Gujarat organise kite festivals. These festivals attract expert kite-makers and flyers, not only from India, but also from around the world. Other festivals include Basant Panchami in Punjab and Pongal in South India.